But when it came time to take real action, Hogan cowered. Recently, a bill crossed Hogan’s desk that, in one fell swoop, would restore the right to vote to 40,000 Maryland residents—disproportionately black residents, many of whom are from poor Baltimore neighborhoods, the vast majority of whom are victims of our discriminatory mass incarceration system. The state legislature overwhelmingly supported the bill, which would give Baltimore the chance to regain their constitutional voice. When Hogan said he was “taking over the situation,” the situation he referenced was not Freddie Gray’s murder at the hands of callous police. In fact, Hogan barely commented on Gray’s death at all, completely failing to rebuke the officers who killed him. What concerned him—what brought him to Baltimore—were the protests that followed Gray’s death. He did not see courage on the faces of the people calling for justice. He did not understand that they were calling for a voice, calling for change to the broken system they live in. These protests were a response to much more than violent policing. They were calling for leaders and lawmakers to act on the needs of low-income communities of color. Freddie Gray’s crime was simply existing. He was killed in West Baltimore, where being poor and black means being shut out of opportunity. Like so many other low-income communities of color, people in Gray’s neighborhood commonly suffer from not only police violence but economic and institutional violence, as well. In West Baltimore, the unemployment rate is 24 percent and the median income is about $24,000. Children born there are bound to be victims of systematic inequality at virtually every juncture, and receive significantly fewer resources than kids in other neighborhoods. Public schools in the area are dilapidated and under-resourced, and the city has closed 14 recreation centers since 2010. This is why Maryland’s felon disenfranchisement laws—which currently bar anyone in prison, on parole, or on probation from voting—are so problematic. Hogan’s description of this law as simply a just punishment further underscores his willingness to turn a blind eye to reality. The economic distress, educational deprivation, and out-of-control policing tactics that plague places like West Baltimore increase the likelihood that those in the community will be funneled through the criminal justice system. Black teenagers are almost as likely to be arrested as they are to graduate from high school, and more people in Maryland prisons come from Gray’s West Baltimore neighborhood than any other neighborhood in the state. The truth is that felon disenfranchisement is a mechanism to reduce the political voice of entire neighborhoods of color. The loss of a vote not only hurts the potential voter, it hurts their whole community. Entire populations of low-income minorities are slowly shut out of our democracy. They are forced to watch their power steadily deteriorate. 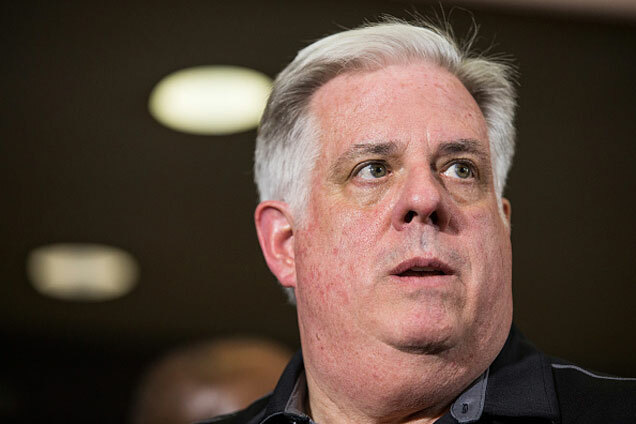 It is not surprising, then, that lawmakers like Hogan have done little to address the West Baltimore community’s perpetual poverty and marginalization for so long. The rampant disenfranchisement in these communities makes voters unable to hold their elected leaders accountable. Since places like West Baltimore have less and less electoral power, lawmakers are free to ignore the issues that confront these constituents. Gray’s tragic death put a spotlight on West Baltimore. But now the news cameras have left, the protests have waned, and the Governor has packed up and gone home. Residents find themselves, once again, abandoned and voiceless. Last month’s protests prove that Baltimore residents need to be heard. Families are crying out, demanding that this broken system be repaired. The state legislature supported giving residents a voice. But Hogan decided he preferred their silence. Baltimore deserves better. Josie Duffy is a policy advocate for The Center for Popular Democracy.